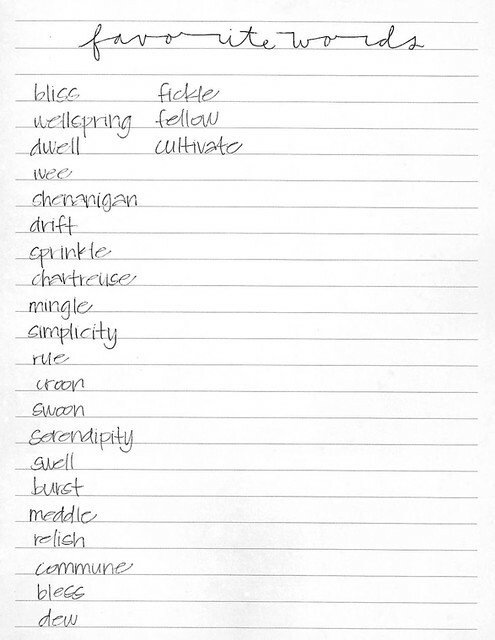 In the back of one of my notebooks, I've been keeping a list of words. Any time I come across a word that really catches my eye, I'll add it to my list. It's not necessarily the definitions that matter (although sometimes they are quite fitting), but more of how perfect they are to say or write. I sometimes wonder how odd it is to keep a list like this, but I have a feeling that there must be some out there who totally get it. If I were to choose, I think that my absolute favorite word is probably "dwell"—because that combination of letters always looks so curious to me. It rolls off the tongue quite nicely, too, don't you think? Dwell. Dwelling. Dwells. Literally every time I read it somewhere, it never fails to elicit some sort of emotional response. Odd, really. And to clarify a few of my other favorite words: I mean wee as in small (which should be apparent, considering I use this word way too much), relish as in "to savor or enjoy" (not tiny and delicious pickle bits), and commune as in "intimate communication" (although, I do enjoy the church-y way, as well). What words would be (or perhaps already are) on your list? I know exactly what you mean! 'Dwell' is a good word. Here are a few of mine: intrepid, placid, canoodle, lethargic, gratuitous, wanderlust, ethereal, mundane, and constitution. Shenanigan is probably my most favorite word! I haven't thought about favorite words in a while, but I went through a period in high school when I was OBSESSED with the word "riboflavin." What can I say? I was a strange child. My favorite favorite word in the English language is "vagabond." Fun to say, fun to be. I love the words chuckle and chortle! No idea why other than they sound nice and make me smile! You should make a list of your favorite girl names!! I need ideas, and I think we have similar taste! Right after my list of favorite words are pages for my favorite girl names and favorite boy names. :) I may have to email you! I very recently started a list like this... several words have caught my attention like endlessly and homestead. Oooh! Homestead is one I will definitely be adding. I'm so jealous of your handwriting!! Perfection! LOL! Pancho is the best. I was tutoring a kid a few years ago and we did this. He was in grade six and spouted off about twenty words immediately which made me adore him. I liked the activity so much I did it too - not sure what happened to my list and I forget most of it, but my favourite word is "bundle." Lots of Hawaiian words were on there - we honeymooned there and they have some amazing words! I too would appreciate your names list! We're pretty much at a standstill and I looove Eisley's name, but am trying to avoid names ending in y because both our son's name and our last name end in y.
Beauty- Stops me in my tracks, reminds me immediately of nature. Epiphany- Reminds me of someone's mind and thinking creatively. Summery- Instantly think of when I was little on vacation at the lake! I totally keep a list like this one too! It isn't so mcuh about the meaning, but more the way the word rolls off the tongue. Here is my list: adulation, alfalfa, pugnacious, flummoxed, moxie, contiguous, encyclopedia, calendar, eclectic, cerulean, gobsmacked, maudlin, abhor, resplendent.